he Greenwich & Lewisham Weekender is an independent weekly newspaper, covering the boroughs of Greenwich and Lewisham. We publish every Wednesday, covering every postcode sector of the borough, and boasting, by far, the highest weekly circulation in Greenwich. Each week, we deliver to homes in every Greenwich neighbourhood, with further copies stocked at convenient public stands. We are also the highest distribution newspaper in Lewisham. 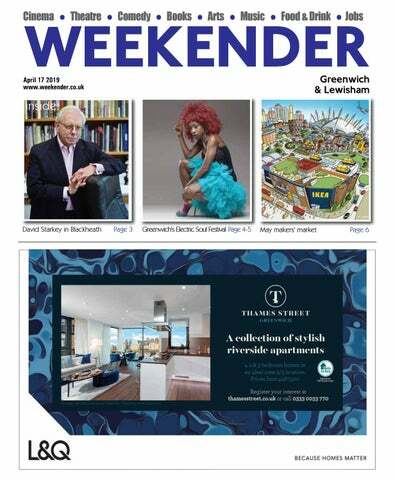 You can also view each edition online, as well as daily news and events, on our website: www.weekender.co.uk The Greenwich & Lewisham Weekender covers all aspects of life in the boroughs, including music, theatre, comedy, film, events, and food and drink, as well as all your community events and campaigns. We would love to hear from you, so if you’re holding an event, launching a business, championing the needs of your local community, or just want to tell us about something that’s happening in Greenwich or Lewisham, feel free to get in touch. WHAT A CEILING! Dine in London’s ‘Sistine Chapel’ as part of an exclusive charity dinner in the newly restored Painted Hall at the Old Royal Naval College. New London Architecture is hosting the event to raise money to tackle homelessness. The evening includes a three-course meal and after-dinner speeches from the architects and directors behind the recent £8.5 million conservation project. Thursday 2 May at 6:30pm-11pm at the Painted Hall, Old Royal Naval College, SE10 9NN. Admission: £225 per person. 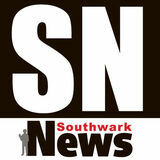 The Greenwich and Lewisham Weekender is published by Southwark Newspaper Ltd - an independent newspaper publisher, based in Bermondsey, south London. Artists on show include: Paper-cut artist Wei Chen, who was commissioned to create HSBC’s 2019 Chinese New Year greeting for their online Business Customers. Wei designed and hand cut a one off animated Chinese folk papercut art version of the HSBC logo being papercut to reveal a paper-cut pig. The piece took over 7 hours to hand cut using just a sculptural knife. Paper cutting is a traditional art in China which began after the invention of paper in Han Dynasty, and became so popular that even the ladies of the royal families were judged by their ability to papercut. Wei’s shop Paper Moon at 4 Greenwich Market opened 12 years ago and features many of her hand cut pictures and cards. Self-taught, Greenwich-based, photographer Kate Jaconello has just had a second of her pictures ‘The London Eye’ featured as BBC England's Big Picture of the Day, following on from her first in December 2018. Kate, who only began photography some 2 years ago, has a stall at Greenwich Market and her work has been featured in publications including The Daily Mail and Guardian Weekly Magazine. fter months of closure, Valley Central Youth Hub re-opened on Monday 8 April, welcoming young people from across the Royal Borough of Greenwich and a number of special guests. space and I was so happy to see 20 young people attending our first youth club session on Tuesday.” Colin Gilham from CACT Principal Partner ITRM was also in attendance. Valley Central offers a range of free activities and sessions to young people aged 10-19 or up to 25 for young people with Special Educational Needs and Disabilities (SEND). The opening hours are: •	Tuesdays 7:15 - 9:15pm - Integrated Sessions Age: 10-19 (+25 SEND) including specialist deaf station •	Wednesdays 7:15 - 9:15pm - Youth Sessions, Age: 13-19 •	Thursdays 6:15 - 8:15pm - Integrated Sessions, Age: 10-19 (+25 SEND) • Fridays 3:45 - 5:45pm - Inter sessions Age: 8-12 • Fridays 6:30 – 8:00pm Football sessions Age: 13-19 To attend or become a member, please head to Valley Central or email rose.ziaei@cact.org.uk. or many, the dream of buying their first home in the heart of one of London’s most desirable boroughs – complete with a view of the River Thames and Canary Wharf – is nothing short of a pipe dream. Thames Street’s sales and marketing suite is open Tuesday to Saturday from 10am – 5pm. For more information or to book an appointment visit thamesstreet.co.uk or call 0333 003 3770. Prices start at £487,500 for a one-bedroom apartment (available under London Help to Buy), £680,000 for a two-bedroom apartment and £785,000 for a three-bedroom home. A limited number of twoand three-bedroom properties are available with Shared Ownership. Prices start at £147,500 for a 25% share of a two-bed and £187,500 for a 25% share of a three-bedroom. ROYAL BOROUGH OF GREENWICH The Greenwich (Free Parking Places, Loading Places and Waiting, Loading and Stopping Restrictions) (Amendment No. *) Order 201* The Greenwich (Charged-For Parking Places) (Amendment No. *) Order 201* 1. 2. Notice is hereby given that application(s) have been made to The Royal Borough of Greenwich in respect of the under mentioned premises/sites.You can see the submissions and any plans at http://www.royalgreenwich.gov.uk/planning. Anyone who wishes to comment on these applications should be made in writing to Development Planning within 21 days of the date of this notice. Please quote the appropriate reference number. If development proposals affect Conservation Areas and/ or Statutorily Listed Buildings under the Planning (Listed Building and Conservation Area) Act 1990 (As Amended) this will be shown within the item below. Site Address:	6 Devonshire Drive, Greenwich, London, SE10 8LA Development:	Replacement of existing single-glazed timber sash windows with double-glazed timber sash windows (painted white) and replacement of front metal door with timber door (painted white).